The destruction wrought by recent hurricanes, Harvey and Irma, have added to the discussion surrounding climate change and what the impacts of global warming are on natural storms. . The question now, is what is the extent of the effect that climate change has on these storms? There are a lot of factors that determine the intensity of a hurricane, but one of the largest factors is related to sea-surface temperature. 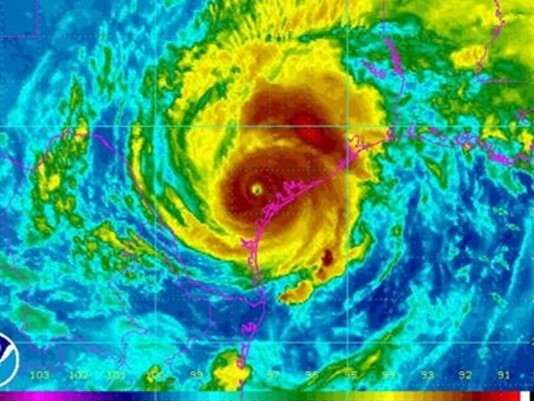 Hurricanes develop when there is a difference between sea-surface temperature and the temperature of the lower stratosphere; the greater the difference, the stronger the resulting hurricane.1 This change in sea-surface temperature is directly linked to global warming and is crucial in the development of catastrophic hurricanes. The critical link between sea-surface temperature and global warming is correlated with an increase in hurricane intensity, resulting in more category 4 and 5 hurricanes worldwide.2 These storms develop as the warm water in the oceans is evaporated into the lower atmosphere. As the winds swirl in this area, the humid air is converged and pulled upwards into cooler air. This temperature difference forces the water vapor to condense into clouds, releasing large amounts of enthalpy, or free heat. This large release of enthalpy causes the air to rise more, acting almost like a vacuum as it continuously cycles the warm air higher into the atmosphere.1 As more energy is pumped into the system, the clouds grow and gain more energy. Eventually the entire system begins to cycle rapidly, causing the pressure in the core to drop which creates the classic ‘eye’ seen in the image above.1 More warm ocean water evaporates into the storm, enlarging it and increasing its wind speeds, and causing the ‘category’ of the storm to increase. A category ‘1’ hurricane is a storm that has wind speeds sustained of 74mph or more. There is a large amount of heat required to reach the catastrophic storms that are considered category 4 and 5. These storms rely on massive amounts of warm water, a resource that is directly linked with our warming planet. As of 2015, the global sea surface temperature has risen over 1.2˚F compared to the average ocean temperature from 1971-2000.3 While 1˚C does not seem like much, it’s important to remember that there are over 332.5 million cubic miles of water in the oceans, and one cubic mile of water equals more than 1.1 trillion gallons.4 That is a large amount of free heat that has been suddenly added to our global water system, creating a hurricane hotspot in regions including the Atlantic, Caribbean, and Gulf Coast. To summarize, hurricanes are caused by differences between sea-surface temperature and the lower stratosphere temperature. When this difference is exacerbated by a rise in ocean temperatures, a greater number of category 4 and 5 hurricanes develop. Thus, it is important to be mindful of this side-effect of global warming, and be prepared for more of these severe storms in the future as our ocean temperatures continue to rise. (1) Emanuel, K. A. The Maximum Intensity of Hurricanes. Journal of the Atmospheric Sciences. 1988, pp 1143–1155. (2) Goldenberg, S. B.; Landsea, C. W.; Mestas-Nuñez, A. M.; Gray, W. M. The Recent Increase in Atlantic Hurricane Activity: Causes and Implications. Science (80-. ). 2001, 293 (5529), 474 LP-479. (3) USEPA. Climate Change Indicators in the United States 2016; 2016; Vol. 46. (4) Perlman, Howard. How much water is there on, in, and above the Earth? United States Department of the Interior, U.S. Geological Survey. 2016.